Ensure Plus Powder is a complete, balanced nutrition with extra proteins to help support recovery. 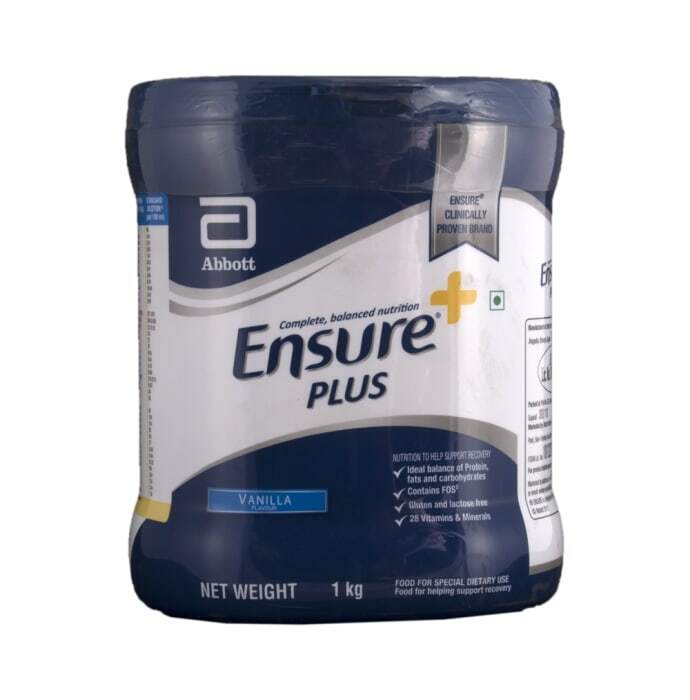 The Ensure Plus Powder has balanced macro-nutrient for optimum utilization of proteins. It may be used either as tube feed or as oral feed. It contains 28 vitamins and minerals including immune supporting micronutrients and is scientifically designed to help malnourished adults to improve their nutritional status and body weight. To prepare 230ml, mix 6 scoops in 190ml of water. To prepare 100ml, mix 2.5 scoops in 85ml of water. To prepare 500ml, mix 13 scoops in 413 ml of water. A licensed pharmacy from your nearest location will deliver Ensure Plus Powder Vanilla. Once the pharmacy accepts your order, the details of the pharmacy will be shared with you. Acceptance of your order is based on the validity of your prescription and the availability of this medicine.